LOS ANGELES, Aug. 21 – It was a typical late-August Saturday night, just after 9pm. Officers Jim Matthews and Bob Siegel were in their cruiser patrolling the area of Imperial and Hawthorne Blvd. when the call came in. A 211 alarm(robbery) at the Western Surplus store on the corner of Hawthorne Blvd. and 134th Street. “The alarm at Western Surplus was a rare event, and they did not have ‘false alarms’, as many stores did, because they were very careful people,” said Siegel. Blocks away at the Western Surplus store a clerk had trigger the silent alarm. Four men and a woman just came into the store with a sawed-off shotgun, ordering two customers and the three employees to lie down on the floor. The group immediately began smashing cases and bringing guns into the rear alley, where another woman is waiting in a white 1966 Ford van. Officers Jim McInerny and Kenny Cox were the first officers to arrive at the scene, parking in front of the building. Both men, with guns drawn, exited their vehicle and took positions on either side of the front window of the store. Lieutenant James Kobus pulled up in unit 55A. McInerny turns and asks Kobus to cover the back alley. “I think I saw someone move inside,” Cox said. McInerny turns around and sees a man duck behind a counter in the rear of the store. Seeing the officers outside, the suspects inside make their way towards the backdoor. Officers Jim Matthews, Bob Siegel, and Kobus pull into the alley entrance as the suspects come out the back door. “Officer Matthews drove around the corner and we saw Lt. Kobus as he pulled up from the south and stopped at the north curb line of 134th street, where he immediately came under shotgun fire from the rear of the store. Fortunately, as Watch Commander, he was alone in the unit, a station wagon because the first shotgun blast went through his right passenger windshield and would have hit a passenger officer full in the chest,” said Siegel. The next blast from the shotgun puts a gaping hole in the emergency light atop of Kobus’ car. Officers Cox and McInerny run west down 134th street toward the back alley. Cox begins firing back at the suspects’ van with his shotgun. Officer McInerny gets behind a short wall that divides the alley and a residence on 134th street. As the van attempts to drive away, McInerny unloads his service revolver into the drivers side window. Out of bullets, a resident comes out of his apartment and supplies McInerny with more .38 ammo. “We seemed to be getting fired on from within or below the van, so I ( and maybe Matthews and Cox) began firing to the rear of the driver door, and below the van, to bounce under the van at unseen suspects,” said Siegel. “Gunfire ceased for a short spell, so I approached the drivers door to open it. Hearing another short burst of gunfire from with in the van I poked the barrel of my shotgun into the driver’s window, pointed to the rear side doors, and fire a single round of double ought buckshot, to clear the area,” said Siegel. “Everybody get out of the vehicle,” shouts Matthews. The officers hear activity in the back of the van. Matthews, Cox and Siegel go around the van and see several armed suspects fleeing on foot. The officers give chase. “One male suspect had hidden under a car at the north end of the parking lot. He snuck out and was last seen running north in the alley, and then westbound on 133rd street. Several of us officers saw him, as did several citizen witnesses, but as we were in a firefight situation with four other suspects, no one was able to disengage to try to secure and identify this individual,” said Siegel. After a few more shots are fired, the remaining suspects surrender and are taken into custody. By the time the fire fight is over about 30 officers from Hawthorne, El Segundo, Redondo Beach, and the Lennox Sheriff’s Station have responded to Kobus’ “Shots Fired” radio call. A LASO helicopter arrived after a short time and assisted in the search for the sixth suspect that escaped on foot. In custody are, Jerry Sherwin, later identified as Mary Brunner, Catherine Share, Joseph Jones, later identified as Lawrence Edward Bailey, Dennis Rice, and Kenneth Como. The sixth suspect is eventually identified as Charles Lovett is taken into custody. No officers are injured but Brunner, Share and Jones all suffer wounds from buckshot pellets. Catherine Share – the driver – has a wounded shoulder; Brunner has an injured hand and Bailey has a shattered knee cap. The motive for the crime is to collect weapons so the group can raid the Gary Hinman-Donald “Shorty” Shea murder trial and free Manson. Bail is set at $100,000 for each suspect. All suspects request to act as their own attorneys. Each requested is denied with the exception of Dennis Rice. On Thursday, June 29th 1972, Charles Lovett becomes the first to be convicted and is sentenced to 10 years-to-life for his participation in a robbery. Dennis Rice is next to be convicted in early 1973. He is sent to San Quentin for a sentence of 6 months to 20 years, but is released 2 years later. He has since become a christian and runs a prison ministry traveling the globe telling his story to prisoners. Catherine Share, Lawrence Bailey, Mary Brunner, and Kenneth Como go on trial together in 1973. Their jury is sequestered after 2 jurors are excused after receiving threatening phone calls. All four are convicted after an 8 day trial. All four claim they’re not guilty by reason of insanity. The defense calls Charles Manson to testify during the sanity phase. Manson testifies that all of them knew right from wrong and weren’t insane. All four are found to be sane at the time of the crime. Catherine Share is sentenced to 10 years-to-life; Kenneth Como is sentenced to 15 years-to-life; Mary Brunner and Lawrence Bailey both receive sentences of 20 years-to-life. Catherine Share is sent to the California Institute for Women in Frontera, where the other Manson girls are serving their sentences. While there, Gypsy and Mary Brunner, together with a group of Aryan Brotherhood members, conspired to break out of the prison using a pair of wire cutters, but were caught at the last minute. Gypsy had fell in love with Kenneth Como (also imprisoned for the Hawthorne shootout) but stopped talking to him after Manson told her not to. Como was in love with Gypsy, and obviously angered with Manson, so he assaulted Charlie in the prison yard. Soon after, Como convinced Gypsy to forget about Charlie, and the two got married; Gypsy eventually divorced Como in 1981. In the late ’70′s, early 80′s, Gypsy was indicted and convicted on a range of Federal charges for her part in a credit card scam. She served a number of years, and somewhere down the line became a born-again Christian. She married a man named Patrick Shannahan, a prisoner turned informant. Mary Brunner served six and a half years at the California Institute for Women, while her son Michael went to live with Mary’s parents. Mary has since took on an assumed name, and is last reported to be living in the Midwest. Kenneth Como was released from prison in 2003 and passed away a year later. Officer Jim Matthews and Reserve Officer Bob Siegal were at 11533 Hawthorne Boulevard when the 211 call came out. Matthews advised Siegal that this was probably a robbery in progress because the alarm at Western Surplus was never faulty. Matthews the driver of the police unit responds to the location and stops his vehicle just north of the front glass doors facing Hawthorne Boulevard and both officers exit the police unit. Matthews looks into the corner of the north-east front window of Western Surplus and observes gun cases being broken and for suspects to be carrying rifles out towards the south-west rear door of the store. Matthews immediately broadcast that they have a good 211 (robbery in progress) and request additional units to respond. As Lt. Kobus pulls his vehicle on to 133rd street off Hawthorne Boulevard his vehicle is immediately struck by gun fire, resulting in the right passenger’s door post and windshield area to be shattered. Within seconds other police units arrived and the gun battle began. At one point the shooting stopped and Matthews grabbed the driver’s side sliding door of the van and pushed it open. Matthews ordered the occupants out of the van at gun point and upon pulling the first suspect out of the van a ball cap fell of the suspect;s head revealing this too be a female. The other suspects were ordered out of the van and arrested. Huh? 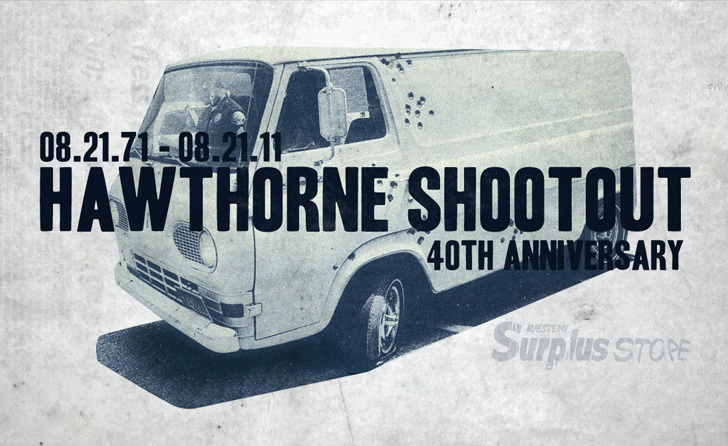 Other sources say he was released in 1981, after serving ten years for the Hawthorne shootout. I was five years old and lived on 135th Street just East of Hawthorne Blvd when this occurred. I remembered being out when this happened. I even ran inside our apartment to tell my mom that a man was on a roof of bar on east side of Hawthorne Blvd. My did not believe me. I think she thought I was playing a game. I went back outside saw even more police cars and a helicopter circling. My mom called me home when my father called and said he couldn’t make it home because of a robbery and shootout. The army surplus store was later burned down by the Patty Hearst group who robbed it in the middle of the night and burned it down. Today a Napa Auto Parts store stands in its place.